Welcome to NAHP. The National Association of Hispanic Publications, Inc. (NAHP, Inc.) is a non-partisan trade advocacy organization representing the leading Spanish language publications serving 41 markets in 39 states, the District of Columbia and Puerto Rico, with a combined circulation of over 23 million. 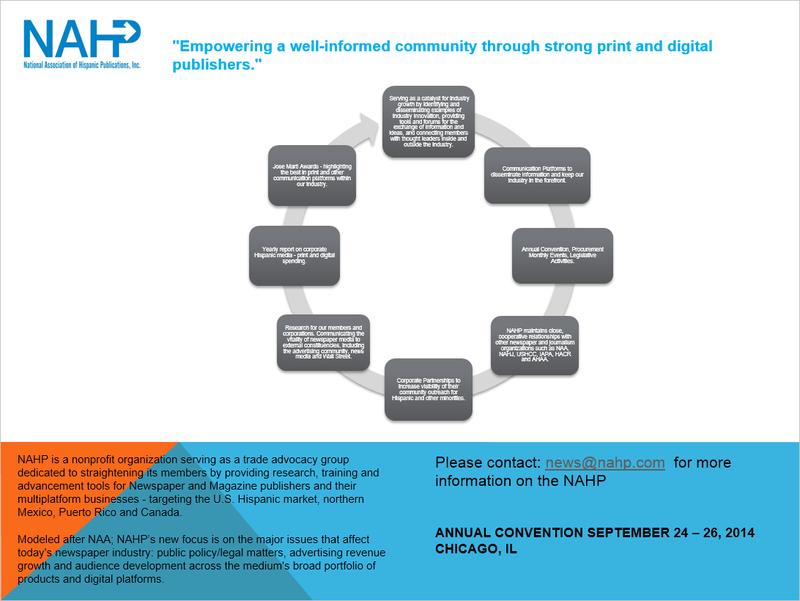 NAHP was founded in 1982 to promote Spanish language publications, the most effective medium to reach the fast growing Hispanic community. Membership is open to Spanish language and Hispanic owned newspapers, magazines and related media as well as businesses that offer products and services to this market throughout the United States. Geographically, NAHP members span the country, with a concentration in areas of large Hispanic populations. NAHP members produce over 15 billion pages of information annually. Hispanics prefer newspapers for their purchasing decisions—making them five times more effective than any other medium. With Hispanic purchasing power now exceeding $850 billion dollars, Hispanic newspapers, magazines and related media offer the best value for your advertising expenditures. OUR MISSION: We further the excellence, recognition and usage of Hispanic publications by providing access to professional development opportunities to better serve and empower our Hispanic communities. Vision: Empowering a well-informed community through strong print and digital publishers. The modern roots of Hispanic newspapers and magazines can be traced to the 1970’s in the USA. Across the USA there were a handful of Spanish newspapers and a couple magazines in Spanish that covered the local Latino community and their countries of origin. At the same new publications were starting in part out the civil rights and political movements of the era. These publications, often from a more assertive editorial stance than their predecessors, aimed to help their readers get the most out of the USA. These publications wanted their readers to become citizens, register & vote, become involved in the schools their children were attending, and, in time, for their readers to become elected officials. Some of these new publications were in bilingual formats and others were just in English. Today 57% of the Latino households in the USA read one or more Latino newspapers on a weekly basis. In the 1970’s the only association of Latino media professionals was the California Chicano News Media Association (CCNMA). In 1981 the CCNMA held the first national conference on Spanish Language Media at UCLA in Los Angeles. Out of that conference came the call to establish two national organizations: One for Hispanic journalists and one for Hispanic publications. Frank Gomez, then an executive with Philip Morris, stepped forward and provided the seed money to get these efforts started. • The National Association of Hispanic Journalists with Gerald Garcia as it’s founding president. • The National Association of Hispanic Publications with Kirk Whisler as it’s founding president. From that early start the NAHP grew fast. Between 1982 and 1989 seven Nat’l Hispanic Media Conventions were held around the USA. Attendance at these events grew to near 2,000 attendees under the leadership of NAHJ Executive Director Frank Cota-Robles Newton. In 1984 the NAHP also held it’s first independent convention in Los Angeles. Miller Brewing quickly signed on as the NAHP’s first true sponsor. Before that conference Pauline Marquez had signed on as the NAHP’s first Executive Director. Forty-nine Hispanic newspapers and magazines were represented at that first conference.